Nicholas Cacioppo of Kings Park earned 26 Merit Badges ranging from Athletics to Soil and Water Conservation. Pictured at the Eagle Court of Honor are Suffolk County Legislator Rob Trotta, Eagle Scout Nicholas Cacioppo and his parents, Victoria and Anthony Cacioppo. Kings Park, NY - July 5, 2017 - Suffolk County Legislator Rob Trotta attended the Eagle Scout Court of Honor for his constituent, Nicholas Cacioppo, of Boy Scout Troop 539 of Kings Park. Nicholas earned 26 Merit Badges ranging from Athletics to Soil and Water Conservation. For his community service project, Nicholas restored a 1962 Willys M38A1 medical jeep by removing all of the rust and painting it, as well as getting the engine to run. He also built a prefab carport to house the jeep, which is on display at the VA Hospital in Northport. “Becoming an Eagle Scout is a testament to your character and leadership skills and is something that you have accomplished while still a teenager. This recognition will stay with you for the rest of your life and can never be taken from you,” said Suffolk County Legislator Robert Trotta. “What you have done is very impressive and we will expect great things from you in the future,” added Legislator Trotta. Legislator Robert Trotta represents the 13th Legislative District, which includes Smithtown, Fort Salonga, Kings Park, San Remo, Nissequogue, Head of the Harbor, and St. James, as well as most of East Northport and parts of Northport and Commack. Legislator Trotta serves on the Legislature’s Economic Development, Environment, Planning & Agriculture, Health,Public Works, Transportation & Energy, and Ways & Means Committees. 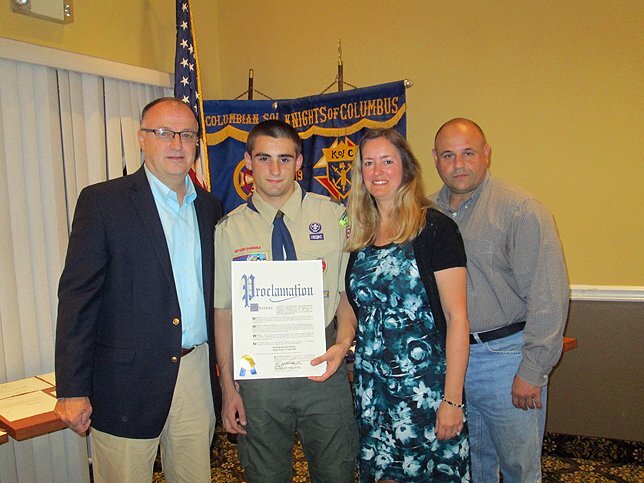 Subject: LongIsland.com - Your Name sent you Article details of "Suffolk Legislator Rob Trotta Recognizes Troop 539’s Newest Eagle Scout"